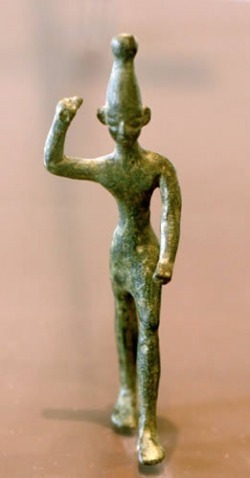 Baal, the bad boy of Ugaritic mythology. Watch out. He's ready to smite something. But what a faaabulous hat! Once upon a time, El, the father of the gods, invited his children to a banquet. “El sacrifices … He proclaims … He slaughters large st[ock as well as small:] [He fells] bulls and [fatling rams,] [year-old calves,] sheep by the fl[ock, and kids. ]” (Direct quotes are from Mark Smith, “The Baal Cycle,” in Ugaritic Narrative Poetry, Parker, Simon B., ed. SBL Writings from the Ancient World Series, Vol. 9. Scholars Press). The text is very fragmentary at this point, but it seems that at the banquet it was decided to build a palace for Yamm, and Kothar wa Hasis (“Skilled and Wise”), the craftsman of the gods, should come to do it. Baal wasn’t about to go without a fight. He picked up a “striker” and let the two punks have it. He had to be held back by his sisters, Anat and Athtart. The story becomes coherent again as Baal and Yamm are preparing for war against one another. Kothar wa Hasis came to Baal, and presented a fantastic weapon to him. He called it Yagarrish, “may he drive away,” and commanded it to strike Yamm in the chest. Baal cast it at his foe, and hit him square in the chest. Yamm was too strong. He didn’t even quiver. Fortunately for Baal, Kothar was ready with another weapon, Ayyamarri, “may he expel all.” As soon as it was in Baal’s hand, it leapt from his fingers “like a bird of prey.” Poor Yamm caught it right between the eyes. He could not sustain the blow and slumped to the ground. Baal took his brother’s body, and dismembered him. With Yamm out of the way, Baal was proclaimed king. In celebration, he prepared a banquet. He serves Mightiest Baal, waits on the Prince, Lord of the Earth. He rises, arranges, and offers him food, slices a breast before him, with a salted knife, a cut of fatling. He stands, serves and offers him drink, puts a cup in his hand, a goblet in his two hands: A large vessel great to behold, a container for mighty men; a holy cup women may not see, a goblet Athirat may not eye. A thousand pitchers he draws from the wine, mixes a myriad in his mixture. He rises, chants, and sings, with cymbals in the singer’s hands. With a sweet voice the hero sings, over Baal on the summit of Sapan. She arranges chairs for the soldiery, arranges tables for hosts, footstools for heroes. Hard she fights and looks about, battling Anat surveys. Her innards swell with laughter, her heart fills with joy, Anat’s innards with victory. Knee-deep she gleans in warrior-blood, neck-deep in the gore of soldiers, until sated with fighting in the house, with battling between the tables. Warrior-blood is wiped [from] the house, oil of peace is poured in a bowl. As Anat was cleaning herself up, Baal’s messengers arrived with a request for her to come visit him. When she came to his home, he prepared yet another banquet, slaughtering an ox especially for her. She delivered her threat, but, once again, it is difficult to really follow the story here. Messengers are sent back and forth. Athirat, El’s wife is approached with the request. It seems that providing a palace for Baal is not a light matter. Perhaps it was politically incorrect because of his fratricide. Now things lead up to Baal’s next conflict, with Mot. It seems that Mot had challenged Baal’s kingship. Baal sent messengers to him, telling him to knock it off. He was king. His palace had been established. If he knew what was good for him, Mot would accept things as they were and submit to Baal with the rest of his brothers. Baal was kind of shaken up by this, and told his brother that he would be his slave, just so long as he didn’t eat him up. What happens next is, again, a bit of a mystery. It is difficult to follow the story up to the point that Baal is commanded to go down into the abode of Mot. Perhaps he was slain? Was he defeated in battle? What about the whole thing with the window? Did Mot sneak in through it? We can’t be sure. 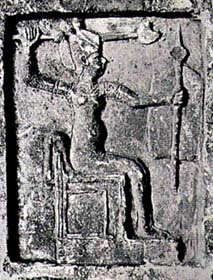 Baal was commanded by someone to go to the realm of Mot. Word was brought back to El, and now that Baal was gone, he suddenly became very fond of him. He mourned him profusely, throwing dust on his hair and cutting himself. Anat went looking for Baal’s body. When she found it, she too wept bitterly, throwing dust on herself and cutting slits in her skin. She asked Shapash, the sun, to help put him on her back, and she brought him back to Mount Sapan, where she mourned him and gave him a proper burial. As part of the ceremony she prepared a massive sacrificial banquet: seventy buffalo, seventy oxen, seventy sheep, seventy deer, seventy mountain goats and seventy donkeys. Back at El’s palace the gods were faced with a grave decision. Someone must take Baal’s place as king of the cosmos. But who could possibly fill this role? No one else was as great and strong as Baal. Athtar “the Strong” decided to give it a try. He went up Mount Sapan and sat on Baal’s throne. The picture was rather comical. “His feet do not reach its footstool, his head does not reach its top. … ’I cannot be king on the summit of Sapan.’” Baal and his life-giving reign/rain were sorely missed. A few days later Anat, distraught for her brother, went looking for Mot. She found him, and held him up by his collar. “You’d better give me back my brother!” she bellowed at him. Shortly thereafter, a remarkable thing happened. El had a dream, in which the skies rained down oil and the river-beds ran with honey. He awoke in joy and announced that Baal was alive. Baal was alive, but no one knew where he was. A search was commissioned to locate him. Anat beckoned Shapash, the sun, to keep on the lookout for him. Evidently Baal was found, because the next we hear of him, he is returning to his throne, after beating up a few of his brothers. Once again the earth would be watered and become fruitful. In a Western story, this would probably be a good place to write “and they lived happily ever after.” Not in this tale. Seven years passed. Then who should show up, but Mot! (Don’t try to figure it out. Just shut up and enjoy the story!). Mot had a bone to pick with Baal. “You’ve caused me a lot of grief, bro. Because of you, I was split with a sword. Because of you, I got winnowed, burned, ground up, sown in the ground, and fed to the birds. Now it’s pay-back time.” Mot didn’t make any outrageous demands. He just wanted to chow down on one of Baal’s brothers. With this, Mot finally backed off and conceded defeat. And so it was that Baal-Hadad was established as king and Mot, the lord of death, was sent hungry back to Hell.